The greatest gift from Saivasiddandam for mankind is both Dance of Siva and Sivalingam. 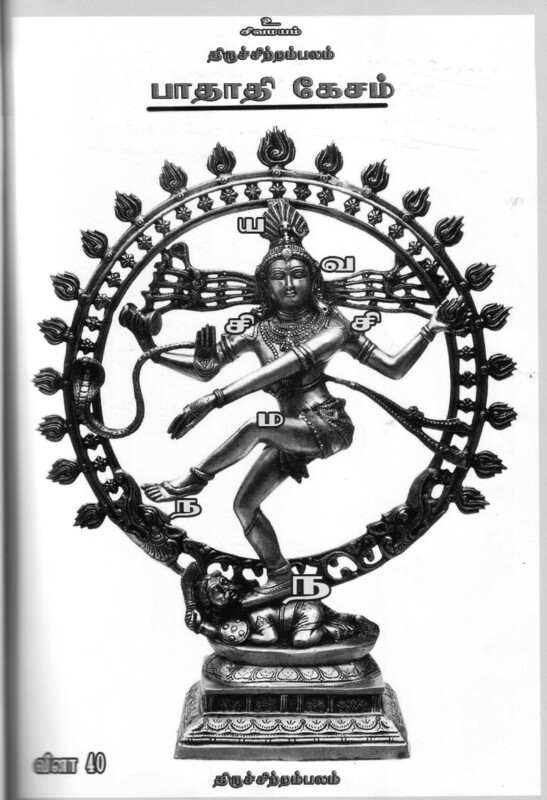 Dance of Siva is the symbolic representation of the universe in dynamic model. It explains the dynamics in the time epoch of Big Bang to Big Crunch. Sivalingam is the static model of the universe for the present time. 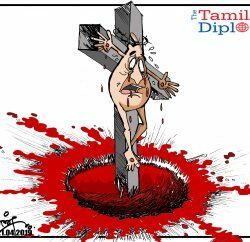 Tamil Hindu philosophy is enhanced by the modern advancement in theoretical physics and Astrophysics. 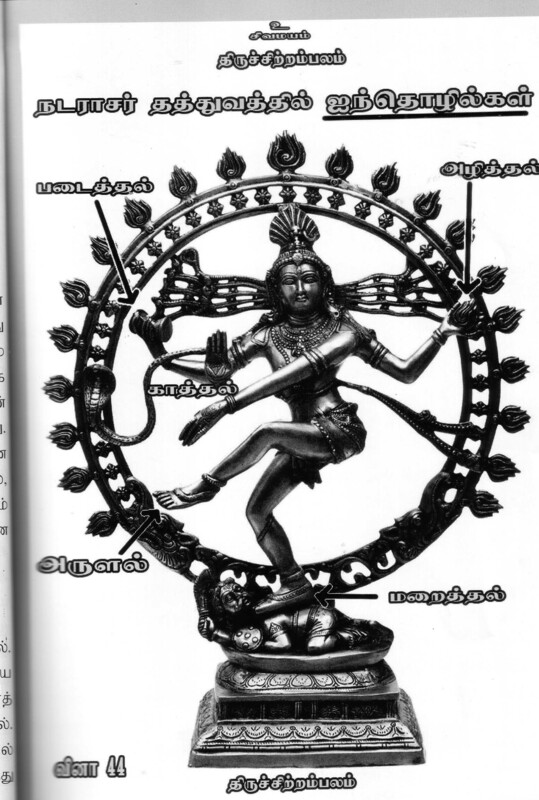 The top down view of dance of Siva (சிவநடனம் கேசாதி பாதம்) implies the perception of the vibration of the universe by the soul. The bottom up view of dance of Siva (சிவநடனம் பாதாதிகேசம்) implies the perception of the vibration of the soul by the soul. 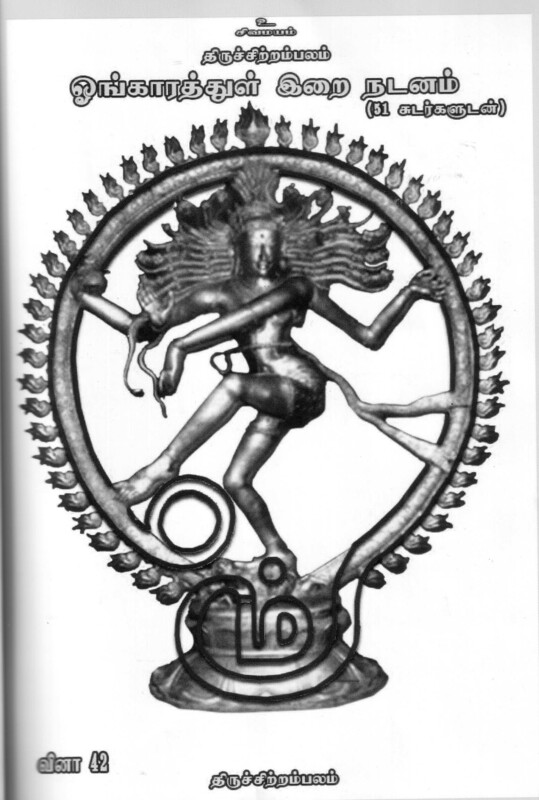 The encircled view of dance of Siva (சிவநடனம் ஓங்காரத்தினுள்) implies the perception of the vibration of the universe by the universe. It is mention by the Late Scientist Stefan Hawkings that we can measure the background vibrations of the universe from the spaceship. 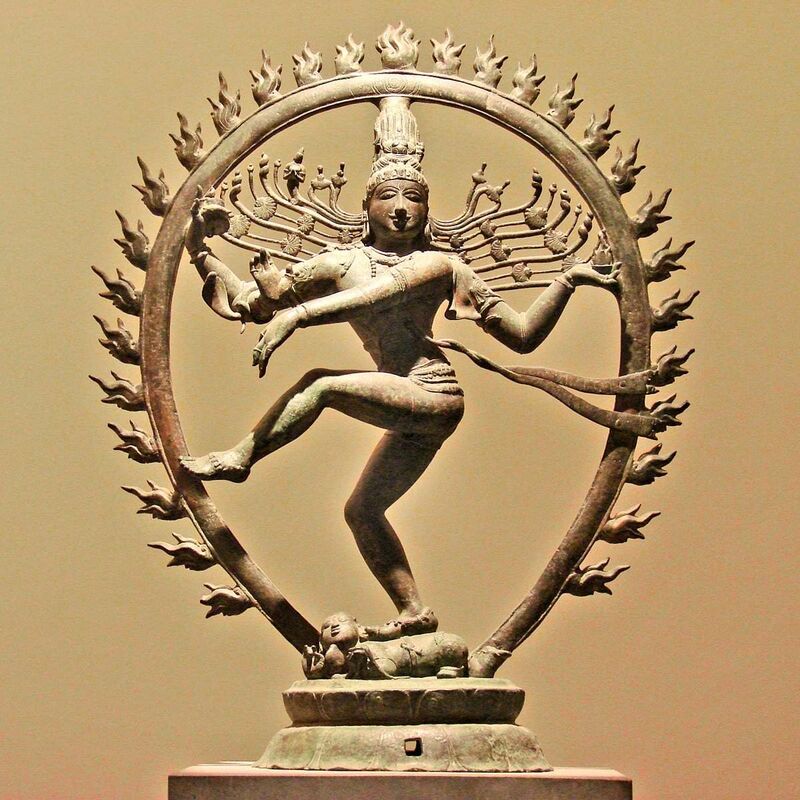 Dance of Siva is the symbolic representation of rhythmic events of the cosmos, where our universe has witnessed seven vibrations for its lifespan. It is one of the rhythmic events. It will be applicable to multiverse theory also. Illusion of life also symbolized by the releases of the countless soul of men from the snare of illusion. And the place of dance at Chidambaram itself is the centre of the universe. According to the modern physics the most fundamental building blocks for the universe is string like objects. The dancing of Siva with serpent is the symbolic for the fundamental building block of universe which is exotic string like objects living in a 26 dimensional space. Einstein’s theory of General relativity and Quantum field theory of elementary particle physics are unified in String theory. Serpent’s movement relative to Dance of Siva explains the string theory model. The visual representation of Dance of Siva and Chithambara Chakaram almost resembles E8 model for Quantum Geometric theory of everything. Scientists have been searching for the unified theory for consciousness for the last few decades. But dance of Siva is the dynamic model for the consciousness and the Sivalingam is the static model for the consciousness. Inflation of the empty space or expansion for Dedemption. The above five physical parameters are symbolized in the dance of Siva. 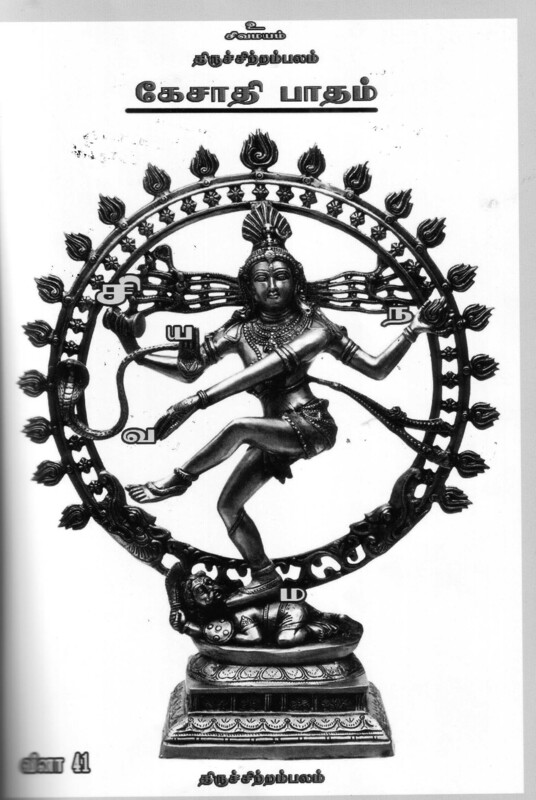 Dance of Siva has duality in Nature for creation and destruction. 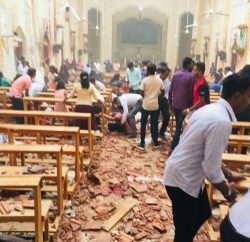 The Big Bang creation is symbolized by the Pleasant dance of Siva (ஆனந்தத் தாண்டவம்) and the Big Crunch (Destruction) is symbolized by the Terrible dance of Siva (அனவரதத் தாண்டவம்). The universal dynamics is within this time epoch. The river Ganga at the forehead of Siva is symbolizing life. Life is like the rivers which are ending in the sea. But the water molecule can recycle. And the water molecules are symbolizing the Soul. Dance of Siva also symbolizing the biorhythms also within the unified vibration as represented by the river Ganga. The Black holes are the highly dense mass which will capture every mass which are approaching it including gravitons which are the fundamental particles in the universe. The Black hole is represented by a demon (முயலகன்) lying down under the dancing Siva with his whole pressure towards the demon by one foot. Dance of Siva’s standing leg presenting the demon is the direction of gravitation goes towards downwards to the demon. Hence it symbolize that universe can be engulfed by the black hole or the fundamental particles have strong attraction towards Black holes.